Following the Don Bosco Tuloy experience, the Rotary Club of Clark Centennial has built a splendid home for ‘street children’ in Barangay Cuayan, Angeles City. 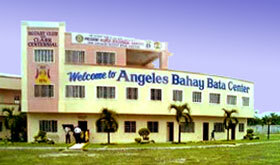 The Angeles Bahay Bata Center is an institution in Central Luzon that seeks to uplift the welfare of ‘street children’. Our mission is to place these children in a safe and caring environment, to give them all the basic necessities of life that any more fortunate child could normally expect. In this setting the children are then given the chance to develop and mature. By giving them an education, psychological support and spiritual guidance, recreational activities and a sense of hope, they have an opportunity to realize their potential, whether it be academically, musically or on the sporting field. We recognize the importance of integrating these children back to their families and society at large, hence our association with other agencies, particularly the City Social Welfare Department (CSWD) which assesses each child’s family situation before the process of reintegration. 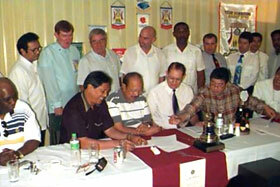 Signing of MOA between Clark Centennial Rotary Club's Charter President Reynaldo Pineda (Checked shirt) and the Government Officials, watched by several RCCC members. Initiated by RCCC Charter President Reynaldo Pineda, the Angeles Bahay Bata Center, offers a place for homeless ‘street children’. The Lazatin family donated the land required for this building while Angeles City Mayor, the Hon. Carmelo F. Lazatin had been active in lending financial and logistic support. There are four classrooms in our school. The initial building has been extended thanks to a generous donation from Mr Kim Bok Kuy, a Korean national, whose life was saved by a Filipino soldier during WW2. 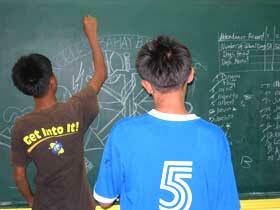 As well as our resident boys, we also educate some children (boys and girls) from the local community. These students are chosen on the basis of their perceived potential to excel while considering socio-economic factors such as level of poverty, educational attainment of parents and the number of children in the family. Realising that computers are playing an important part both in the education of children, and their future work-place, a computer laboratory has been set up with a matching grant from the Rotary Club of Strongsville, Ohio, USA. We are now able to equip the children with the basic tools they will need in the future, knowledge of using a computer, and its main core office products. 2010 saw the introduction of the Alternative Learning System, a program designed to allow students who are behind compared to their age group to catch up out of school. The ALS teachers (from DepEd) come during their vacations (80 days in all per year) to give extra tuition. It costs over $500 for the teachers transport and extra learning materials. The ALS program is also extended to adults who have had no formal or limited education. Can you help us with our feeding, clothing and educational programs for the resident children? Charter President Reynaldo Pineda looks on as President of the Philippines - Gloria Macapagal Arroyo is greeted by Mark Smith, Treasurer, Rotary Club of Clark Centennial. Female children who are rescued or referred to us are given temporary shelter in our halfway house until arrangements can be made for subsequent referral to the appropriate agency. Set in its own grounds, this 3 storey building has 4 spacious dormitories that can house 60 children, however, owing to present funding constraints, in-residence capacity has been limited to 30 children. There are also restrooms, a library, an audio-visual room, a dining room / cafeteria, a medical clinic, administrative offices and quarters for the house parents. 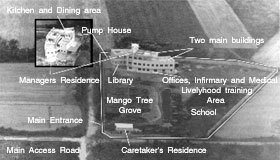 Within the grounds are a school, a halfway house, a caretaker’s house at the entrance and a basketball court.